I invite up to three painters per week to come investigate still life painting with me in a beautiful estate outside of Bergamo, Italy. Three, 5-day courses still have some slots available. By keeping the courses small I intend to focus deeply with each participant, and learn from one another. Daud Akhriev, my amazingly talented husband, is teaching two weeks of oils and one week of watercolors. Truly, something for everyone. I’m pleased to be showing with my husband at the beautiful Russian Artist’s Union in January, 2019. Opening night, 11 January, 2019 4:00 pm. The second Art Throwdown Family Fued at Townsend Atelier playfully pits family members Daud and Timur Akhriev and Melissa Hefferlin against one another and the clock, as they paint brush-to-brush from a live model. 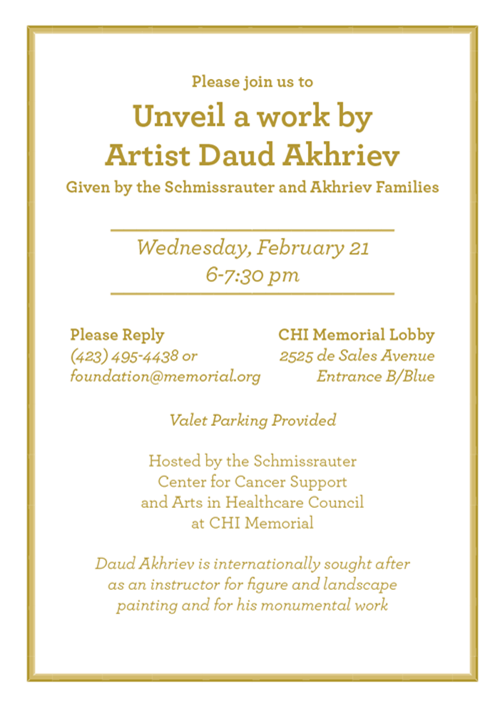 A painting by Daud Akhriev, my husband, will be unveiled at Memorial Hospital, Chattanooga. Accompanying the event we open a month-long exhibition for the hospital with the family of artists: Daud, Timur Akhriev our son, and myself. Forty percent of any sales will go to the hospital's art fund and/or the Schmissrauter Cancer Support Center. Please join us for the unveiling! We're going to introduce eight beautiful new scarves at Amanda Pinson Jewelry on the 15th of March, a Thursday night! We'll have a WONDERFUL time so please come celebrate the new collection. Here's a teaser scarf: Night Rabbit, silk twill, 39x39 inches!! Hefferlin's only masterclass in 2018 at Townsend Atelier. Announcing membership and an exhibition at the Artists' Union of Russia in St. Petersburg. Opening December 25, 2018. Serithea Silk Scarves in Hefferlin Designs coming soon. Serithea Silk Scarves result from our efforts to realize a dream of making art wearable. My husband, Daud Akhriev and I are beginning small, taking time to learn a new trade and get details right. We both love silk and pattern, and now four designs by Daud are available online at www.serithea.com. Next month two images of mine, from linoleum prints, will be available in three sizes, thus three price ranges. One will be a scarf from my print "The Way," and the other an homage to the pleasure of Andalusia and the Alhambra. I'll keep you posted. Daud Akhriev and I have formed a new venture, Serithea, a brand presenting artisan, heirloom-quality silk scarves. The designs are our own, printed in Italy and China on the finest silk twills and silk satins. The journey into a new field is rewarding and challenging. We hope you enjoy the results. I am participating with Daud and Timur Akhriev in this salon event presented by Linda Woodall. Expect a variety of artwork in many media, a demonstration of printmaking, and interesting conversation. You can get in touch with Linda Woodall Fine Art through her facebook event page. If you cannot attend the event on 10 March, feel free to make a private appointment with Ms. Woodall. My son, artist Timur Akhriev, practices the craft of preliminary studies. I admire him for that. I am generally too impatient a painter for the preliminaries, preferring to do my erring (poem!) right on the canvas. But in his honor, I'm doing studies for a composition of my equestrienne friends in Spain, hanging out at the barn where we all ride. The ease of companionship, the love of horses, the mutual affection, well, I love it all. The first study, below, has something that I want to keep in its mood, but I'm trying more permutations. I think the painting needs to be large. I'll keep you posted. Hefferlin oil painting "In the Window" is chosen for the 2016 non-member National Juried Exhibition in NYC at the historic Salmagundi Club for the arts. If you're in NYC, be sure to stop in. The club is beautiful, and the exhibition is sure to be memorable as well. After the Morning Workout is a finalist in the American Women Artists 2016 Spring Online Juried Exhibition. I appreciate AWA working hard for their members, and am delighted to be chosen. Click Here to find the exhibition in the next day or two. Hefferlin teaches a linoleum-printing class at Townsend Atelier, in Chattanooga, TN. The class will describe different approaches to designing a linoleum print, how to cut the print and to transfer the image to paper. Sign up soon on the Townsend Atelier website! Welcome to the 1405 Williams Street Gallery and studio for an exhibition/open house on April Fool's Day, the 1st. The show will hang through the 15th of April, and often be open during the day, but a phone call might be best before you cross town just to make sure you get the white glove treatment and we have not run to the art supply store or something. We are delighted to present new still life, new mosaics, new block prints and much more. Our family of three painters (Daud Akhriev, Timur Akhriev and myself) all admire the brilliant brushwork of Russian painter Nikolai Fechin, but Timur loves him the most. Yesterday Ruth Garren, of Garren Gallery, posted a photo of Timur painting an oil sketch live at the Beverly McNeil Gallery in Birmingham. I thought it was interesting to look at the oil-sketching brushwork of the the two men side by side. Artist Timur Akhriev, my son, painting live at the Beverly McNeil Gallery yesterday. Along with Daud and Timur Akhriev (husband, son, respectively), I am very happy to be suppliers of rotating art exhibitions to The Patten Group, in Chattanooga, TN. While Daud and I were out of the country, Timur Akhriev and Natasha Romanova rotated in a new exhibition, and they sent in photos. Renting fine art while building equity can be a good decision for many kinds of businesses. For more information on the work of The Patten Group, click here. I have just returned from a long winter visit to St. Petersburg, Russia, where the rich cultural tradition is always a creative boost for me. I spent a day alone at the Russian Museum. My husband and I both visited the studios at the Russian Academy, our Alma Mater, and were very impressed with the studios of teacher Vladimir Lipets, whose enthusiastic young painters were doing really nice first year work. The still lifes were particularly elegant and intricate. Three plays at the Theater Pokaleniy, under the direction of the talented Danila Korogodsky, gave me lots of food for thought. Danila's art direction is so creative, his use of light and simple props so astonishing, that I churn on those images for years to come. I also enjoyed the conversation and new work of artists Kurbanov, Chukhleb, and N. Fomin. A Christmas Eve chamber concert at the Smolny monastery left me in tears, it was so lovely. With Igor Chukhleb we visited the graves of our professors and artists we admire: Mylnikov, Fomin, Sokolov (x2), Zagonek, Anikushin. Now I'm back in my studio trying to filter the inspirations into my own painting practice. In front of the Russian Academy of Fine Art (the Repin) where I studied in 1990-1991 in the studio of Andrei A. Mylnikov. I love this place. To celebrate the popular MainX24 festival, Townsend Atelier will be holding its 2nd Annual Instructor Portfolio Show & Sale in its new home in the Arts Building. Townsend Atelier instructors are cleaning out their art portfolios for MAINX24 at this special, annual exhibit and sale.Sketches, maquettes, paintings, drawings, studies and all sorts of great and affordable treasures by some of the regions finest visual artists. A great opportunity to add incredible artwork to your own collection or find a special gift for the holidays. Hefferlin is happy to participate, assisted by Natasha Romanova, as the artist is abroad. Participating artists: Daud Akhriev, Timur Akhriev, Mia Bergeron, Durinda Cheek, Angela Cunningham, Laura Bohon Hausler, Melissa Hefferlin, Jas Milam, Cindy Procious, Stan Townsend, Brett Weaver & Maria Willison. Artists, Mia Bergeron and Timur Akhriev will also be on hand throughout the day to do original portrait sketches. Get an original portrait made by one of our city's best artists. Cost: Suggested donation. First come, first served. Since 2009, Townsend Atelier has been providing quality art materials and art instruction in a wide variety of media to those who wish to advance their talents and interest in visual art. Beginners and advanced students are welcome. In October of this year, Townsend Atelier moved to the freshly minted new Arts Building on 11th Street and has expanded classroom space as well as a retail store of materials. For those of you who collect Hefferlin hand-pulled linoleum prints, or give them as holiday gifts, there are four new prints available in very small, numbered editions of 30 or 40. There are two stallions, Bocefalus (mount of Alexander the Great) and Caribeño (fabulous stallion at Epona, Spain). The stallions are meant to hang as a set, facing one another. There are also the Christmas Nymphs, smaller this year, and aloft in front of a harvest moon. This year, my first holidays without my late father, we watched a total eclipse of the moon from a Spanish roof, and so the lunar glory is on my mind. The nymphs come black and white, or printed on blue and hand-colored. Pricing ranges from $70-$120 depending on size and whether or not hand-colored. Contact the artist or www.romanovaart.com for more information and holiday delivery. "Caribeño," Hefferlin, linoleum print on Unryu paper, edition of 30. Also comes in red on what Unryu paper. 7.75 x 8.75 inches. $85 each. "Bocefalus," Linoleum print on Unryu paper, edition of 30. Also comes in red on whate Unryu paper. 7.75 x 8.75 inches$85 each. "Milky Way: The Nymphs Learn to Fly" Hand-Colored Edition of 20. Linoleum cut on Unryu paper. 3 x 13 inches. $120 each. "Milky Way: The Nymphs Learn to Fly" Linoleum cut on Unryu paper, 3 x 13 inches, edition of 40 hand-pulled prints. $70 each. Hefferlin is pleased to have paintings on exhibit at Birmingham's renown Beverly McNeil Gallery. 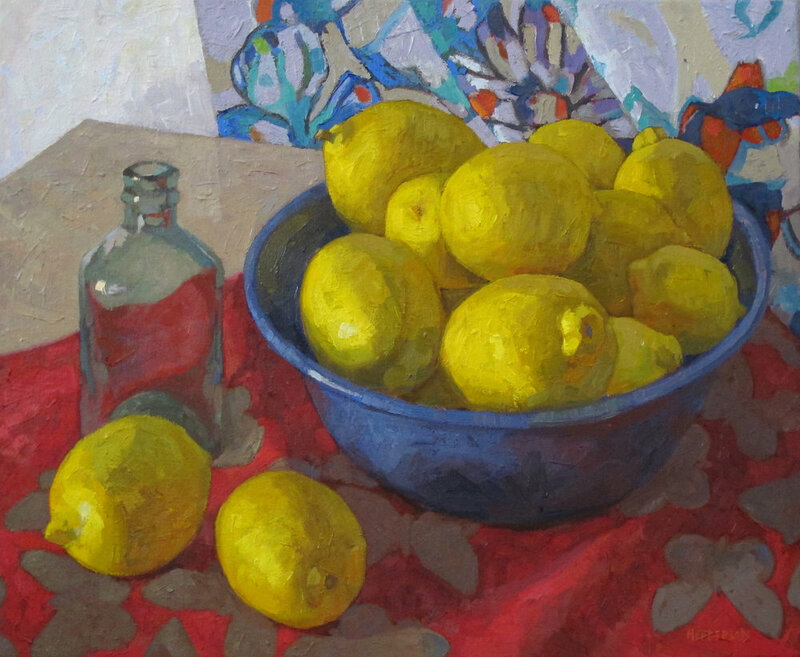 Stop in to see the newest still life from the Spanish studio. The artist is very happy about this new partnership. Melissa Hefferlin, Mary Lynn Portera and Daud Akhriev collaborate once again in this exhibition themed around water, glass and Venice. Hefferlin presents fresh, whemsical still lifes from the last two years, Akhriev presents oil and watercolor paintings of Venice, and Portera presents vessels, functional and not, in classic Mediterranean forms, with glazes inspired by water and Venice. Unifying the individual bodies of work are collaborative pieces between the artists. Melissa Hefferlin was inducted into the Pastel Society of America as a signature member March 1st, 2015.